Mallard Marsh Campground is next to Hosmer Lake, a tranquil, hidden jewel of green and blue surrounded by dark green forest with a stunning view of Mt. Bachelor, South Sister, and Broken Top in the background. Mallard Marsh Campground along with South Campground has a loyal following of campers who return every year, and the campgrounds together are often referred to as the Hosmer Lake Campgrounds. 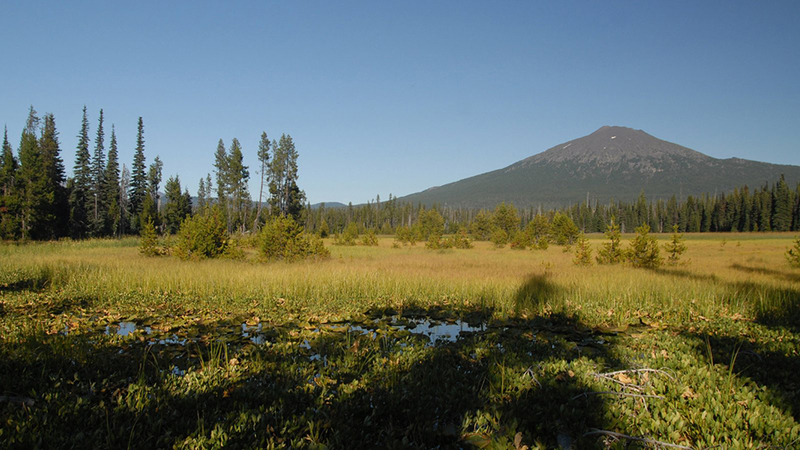 Mallard Marsh is about 37 miles southwest of Bend and offers easy access to trails for hiking and horseback riding. Hosmer Lake is open to non-motorized boats and is beloved by canoers and paddleboarders, not to mention fly fishers looking to catch brook trout, rainbow trout, and Atlantic salmon. Mallard Marsh is made up of 15 mostly large camp sites that are fairly secluded, and reservations can be made online. The campground is typically open mid-June through late September and the per night, per site fee is $10 for the first vehicle and $5 for each additional vehicle.